Women have a fashion gene in their DNA. Some men have the gene, but the gene has irregularities. Those innate miscues can give men fits when it comes to putting a well-orchestrated fashion statement together. Men make fashion mistakes and women try to correct them, but some men don’t care if their belt doesn’t match their shoes or they wear a short sleeve shirt with a crazy pattern tie. Dirty shoes and cheap shoes are always fashion deal breakers. And pants that completely cover shoes are a sign that a man has no idea what a good tailor looks like. 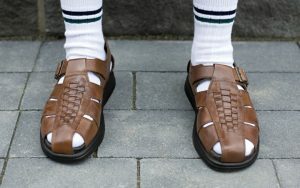 Fashion mistakes are a way of life for some men. Men who wear ties that never reach the top of their belts are as common as the men who wear socks that aren’t long enough when they sit down and cross their legs. And the men who don’t think about matching their suit color with their skin color are a dime a dozen in big cities as well as in small towns. The men who wear wrinkle clothing, or they put on a backpack with a suit show the world they failed men’s fashion 101 without saying a word. And the men who forget hairstyles are important, or they do the old comb-over trick, don’t realize those mistakes are turnoffs for some women. Plus, that extra dab or two of cologne can empty a party room faster than a speeding bullet. But the worst fashion mistake any man can make is wearing clothes that don’t fit. Blog submitted by Dev Randhawa. As a male fashion blogger, Dev Randhawa writes about the biggest trends driving the men’s look this coming year.